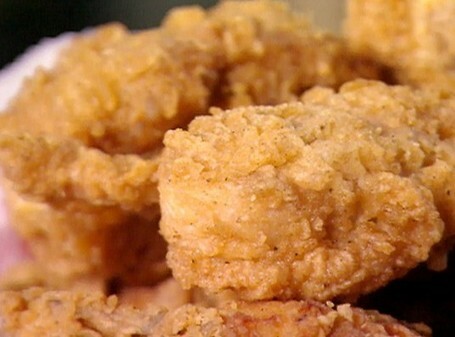 This is a fantasticly easy Southern Fried chicken recipe all the way frm the deep southern reaches of the United states. So next time you get that KFC craving, you don't even need to leave the house!. I can guarantee that this recipe is nicer than that of any take-away restaraunt and after seeing some of the local news this week I can also guess it is going to be quite alot safer! Just follow these simple directions and you will be on your way to making the best Southern fried chicken! This is my personal and favorite Southern fried chicken recipe so I would be grateful if you would let me know how you get on with it. Just collect these basic ingredients and start your Southern fried chicken journey! Bare in mind that the key to this dish is the quality o fhte eggs, so if you can pick up local fresh eggs or at least free range. In a large bowl, mix together the salt and pepper with the self raising flower. Use cracked black pepper corns for that 'authentic appearance'. Crack the eggs into a sperate bowl and mix with 1/4 Cup of water. Add the hot pepper sauce and mix well. Rub salt and pepper onto the chicken pices and then put them into the egg mixture, ensure that they get a good caoting of egg adn then put them straight into the bowl of flour. Find a nice big pot and fill it with enough oil to deep fry the chicken. Get the oil as hot as you dare (180 C is enough). Drop the chicken pieces in and fry for about 15 minutes, or untill they turn crispy and golden. I think you wil find that this recipe will scare the Kernal into cleaning up his act but untill then, just enjoy your feast!